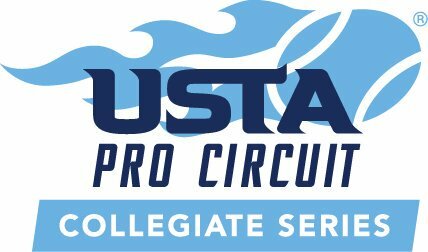 7 of 16 first round main draw singles matches were played yesterday at the ITF Pro Circuit/USTA Pro Circuit Collegiate Series $25,000 Winston-Salem Futures. 4 of the 14 competitors playing had come through qualifying to get in the main draw: Daniel Manlow (GBR), Emil Reinberg (USA), Aron Hiltzik (USA), and Austin Smith (USA). That means they already played and won matches Saturday, Sunday, and Monday – in 90+ degree temperatures – just to get into the main draw. 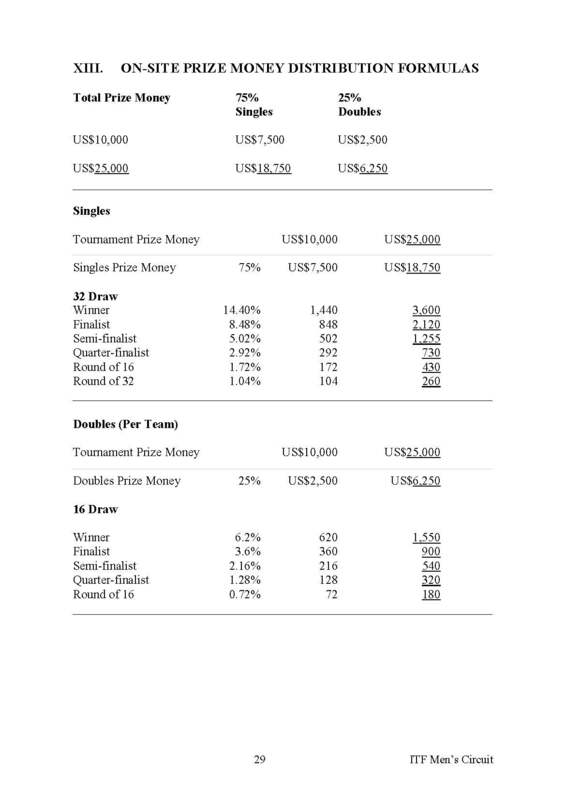 For winning 3 matches, the 8 qualifiers earned a minimum of $260 (first round main draw losers prize money) and accumulated at least 5 days worth of expenses. In today’s first round, 2 of the 4 qualifiers won their matches: Reinberg and Hiltzik. This brought their prize money up to at least $430. 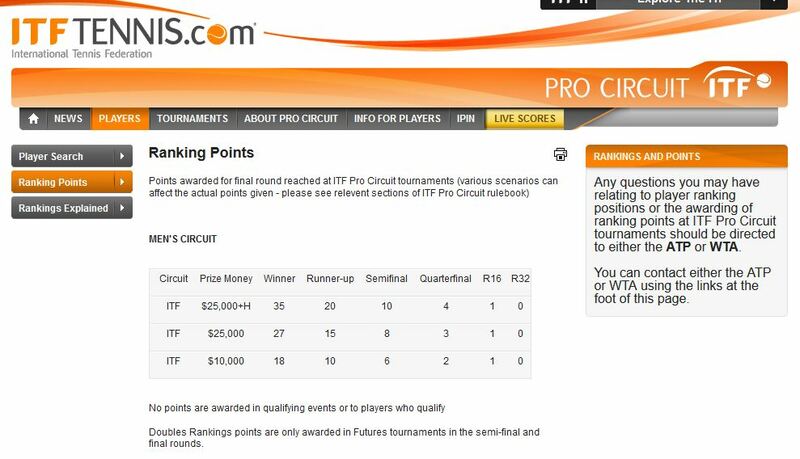 Of course, as valuable to Reinberg and Hiltzik as the prize money is the real prize: ATP RANKING POINTS. By winning 4 matches, they both earned 1 ranking point. Sadly, despite winning 3 qualifying matches, Manlow and Smith both earned 0 ranking points. There is also the “luck of the draw” lurking in all of this. Austin Smith drew the #4 seed and world #334 Michael Mmoh in the first round (and battled him to a 5-7, 6-4, 5-7 score line), while Hiltzik drew world #781 Mico Santiago. And let’s not forget about the “lucky loser.” Nathan Ponwith got up early to sign in after losing in the final round of qualifying to Aron Hiltzik. He made the main draw when Aleksandar Vukic withdrew and plays #7 seed Alex Kuznetsov Wednesday. In the second set of first round singles matches to be played Wednesday, the other 4 qualifiers will play. 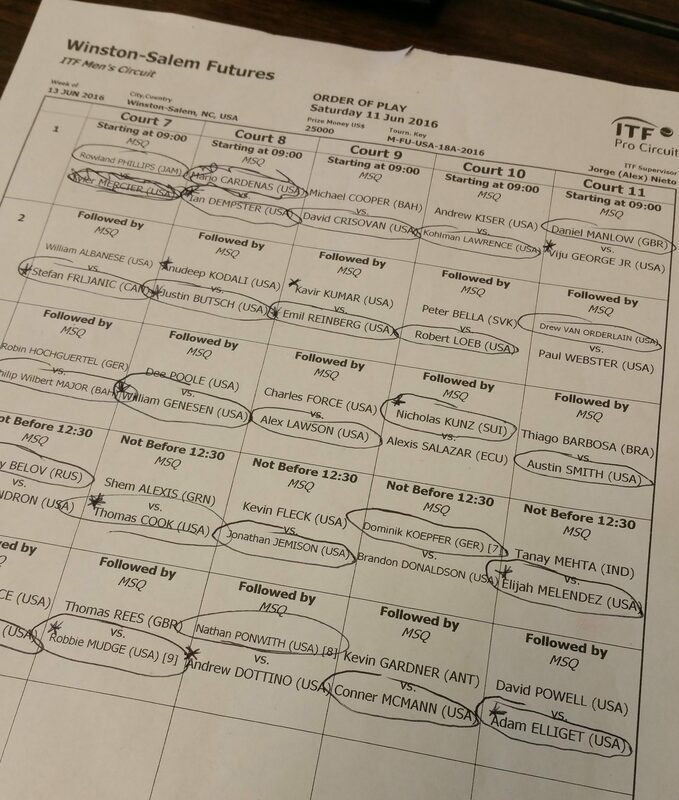 Zeke Clark drew the #3 seed Tennys Sandgren. Korey Lovett will play recent Wake Forest graduate and wild card Jon Ho. And the other two qualifers drew each other: Dominik Koepfer and Rhyne Williams. So, at least 3 of the 8 qualifiers will play in round 2 of the tournament and get their slightly bigger paycheck and their ranking point payoff. Checking in again from the ITF Pro Circuit / USTA Pro Circuit Collegiate Series $25K Futures of Winston-Salem. 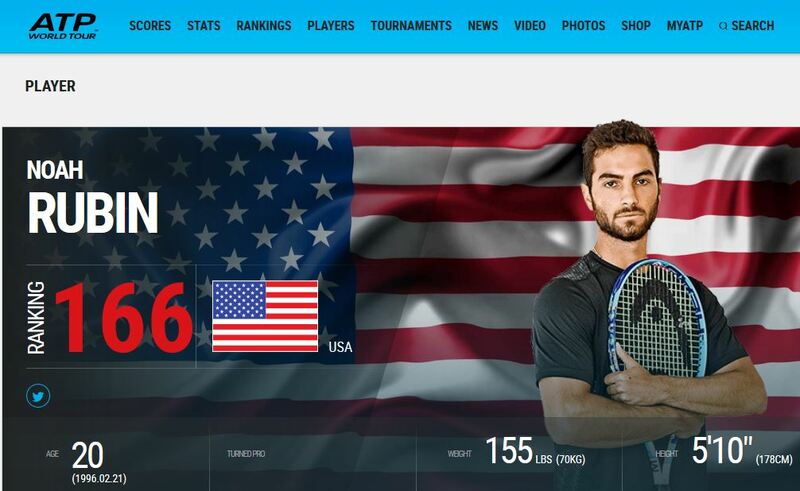 One of the players in last year’s tournament was Noah Rubin. 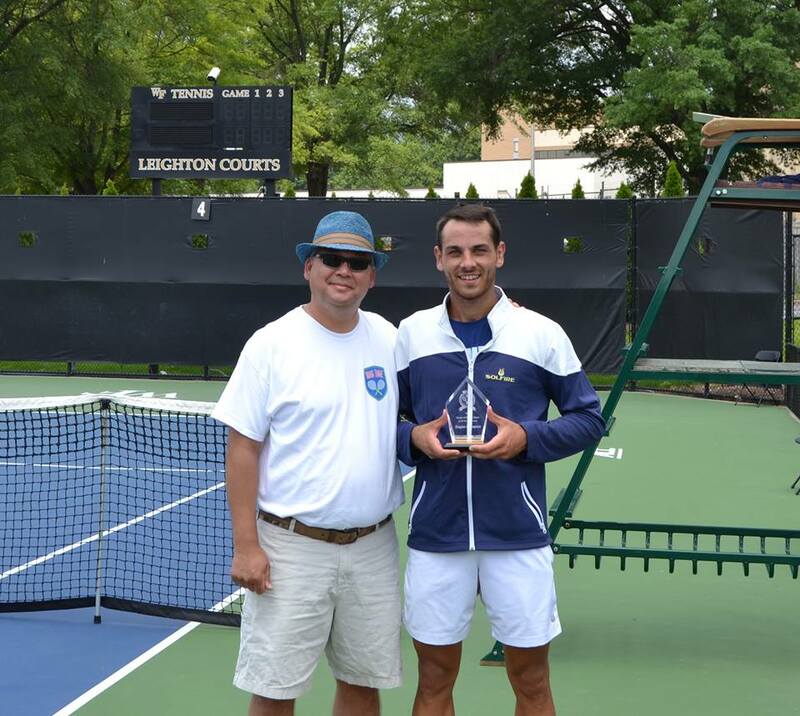 Rubin was coming off a runner-up finish in the NCAA Division I men’s tennis tournament. He won a round then lost to the 3-seed and eventual finalist Tennys Sandgren 7-5, 6-3. He went home to New York and announced he was turning pro a couple of days later. 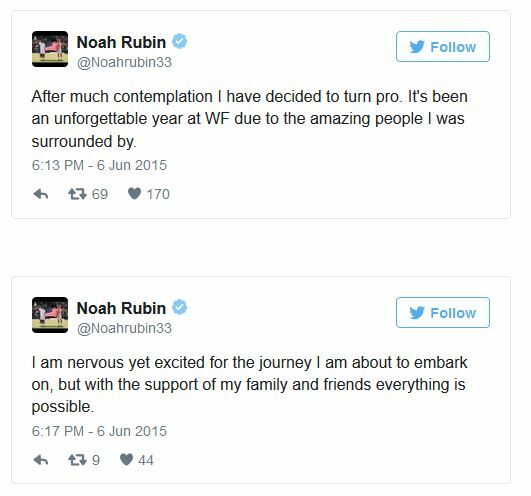 As the racket technician for Wake Forest University’s men’s tennis team, a lot of people asked me last year whether I thought Rubin was making a good decision in leaving school to become a professional tennis player after his freshman year. I told them I didn’t really know, because my expertise is in tennis equipment not the ins-and-outs of professional tennis. But someone more knowledgeable than me said that if Rubin was in the Top 200 of the ATP rankings in a year’s time he would have made a good decision. 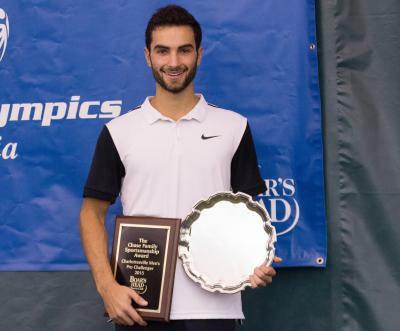 As it turns out, Rubin won the Charlottesville Challenger that fall and finished the year with an ATP ranking of 340 (up from #591 at the end of 2014). 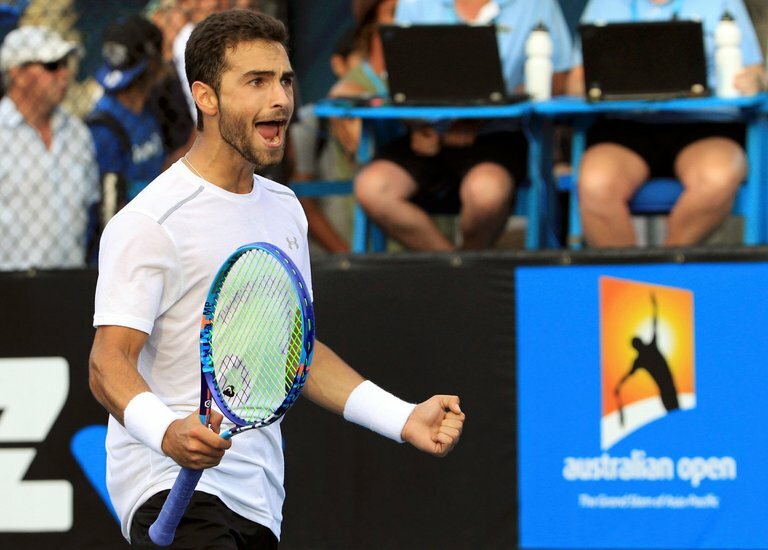 He also earned a main draw wild card into the Australian Open and won his first round match over top 20 player Benoit Paire. His current ATP ranking is #166. So, by that measure, he made a good decision. In addition to working with the men’s tennis team, I am also (or, rather, principally) a sociology professor at Wake Forest University. As a faculty member, my goal for every student who enrolls is first for her or him to learn and become a better person, and then to get a job doing something they have a passion for and which makes the world a better place. 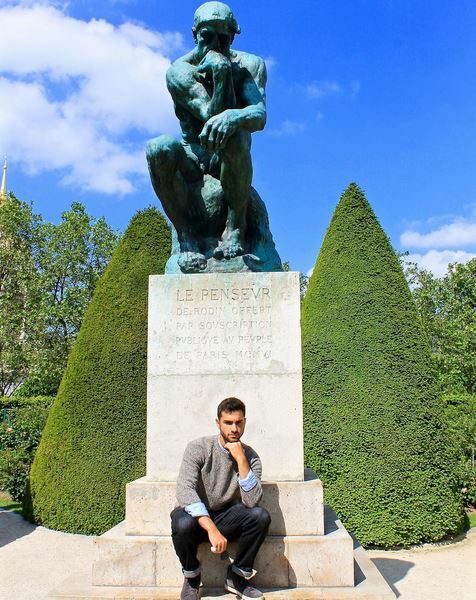 By these measures, as far as I can tell from following him on social media, Noah Rubin is succeeding as well. I am happy to have him out in the world representing Wake Forest University and Wake Forest men’s tennis. Racket stringing, even in a tournament situation, is a lot like the movie “Ground Hog Day” (where Bill Murray gets trapped in a reality in which every day he wakes up and repeats the previous day). Take racket in, cut strings out, mount frame, set tension, install strings, stencil . . . repeat . . . repeat . . . repeat . . . 10 or 20 or 30 or N times. This week I am back stringing at the ITF Pro Circuit USA F18 Futures of Winston-Salem, which has been upgraded from a $15K to a $25K event as part of the USTA Pro Circuit Collegiate Series. 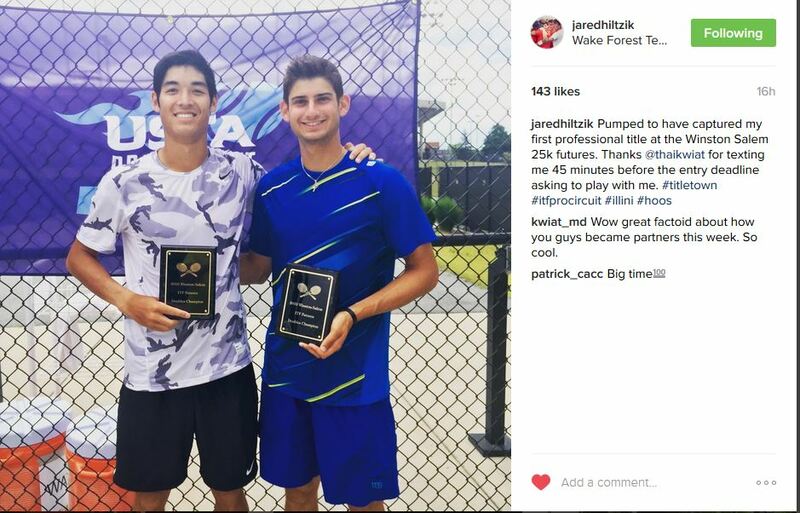 Last year was the first time I strung a futures level tournament, so I wrote quite a few blog posts about the experience. I especially enjoyed working for and getting to know last year’s winner Matija Pecotic, in no small part because he appreciates the importance of what good stringing brings to the competitive table. I was happy to see that he rode the success he had in Winston-Salem to a career high ATP World Tour ranking of #206 near the end of 2015. I’m not sure (yet) who will be this year’s Matija Pecotic, but I do have some observations about the stringing so far. Of the 52 players in the first round of qualifying, only 15 had rackets strung on-site (less than 30%). However, of those 15 players, 11 won their matches (a .773 winning percentage). Of the 4 who lost, 2 lost to players who also had their rackets strung. So, ignoring those 4, of 11 the players who had rackets strung on site and played guys who did not have rackets strung, 9 won their first round qualifying matches – a .818 winning percentage. Of course, correlation does not equal causation. Did they play better because they had their rackets strung for the match, or do they have their rackets strung because they are better players? I don’t have data to answer that, and I’m not sure any professional tennis player would want to be part of a controlled experiment to find out. But I do know what people for whom money is not an issue do to maximize their performance: they play matches with freshly strung rackets. I understand the economics of tennis don’t permit every player to use professional stringing services every day. I have been on the paying end of junior tennis and am still recovering from it (I don’t string rackets for fun). And I wrote about the tough economic realities of a $15K futures event last year. But the cliché “penny wise, pound foolish” exists for a reason. The only part of a tennis player’s equipment that is supposed to touch the ball is the strings.